What is AutoMapper in C#? AutoMapper is used to map data between two objects. In this blog, we will see how to use AutoMapper in our application. Let's demonstrate the use of Automapper by an example. We have another class called Member with 3 properties - Name, City, MemberType. Now, if we want to map the objects of Employee and Member class, then you can map each property one by one as shown in below code. But the above coding practice does not look efficient or smart programming. To map these 2 objects we will use Automapper. 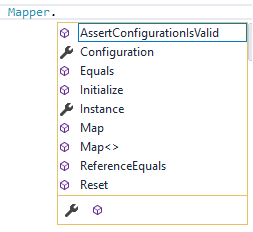 So, in order to use Automapper right click on project name in Visual Studio and select "Manage NuGet Packages..."
Search for Automapper and install it in your project. Post successful installation of AutoMapper, change the code in main method as shown below. Once you run the application, you will get Name and City value in destination object i.e. in Member class object. Note: I have used Visual Studio 2017 and Automapper version 7.0.1. Before AutoMapper 4.2 there was a method called CreateMap. But this method was removed from version 5.0 onwards. In above example, we have used same property name in both the classes. How to map different properties name between objects. In Member class, Name is now FullName and City is changed to Location. Now, if you will run this code, you will get NULL output. Note - I have just changed the property name while printing on console. But that is not working. So, to map different properties name we have to use ForMember. Now if you will run your application, you are going to get the same output. Hope you like this blog. Please comment your feedback below and share this blog. Is Angular JS different from Angular?